Many of the water supplies and people are poisoned with Mercury from the mining operation. The region of Diwalwal, dominated by Mt. 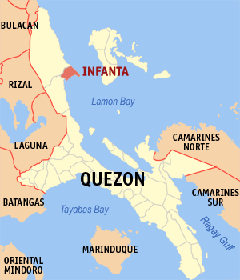 Diwata, is a gold rush area on Mindanao (Philippines) where approximately 15000 people live. 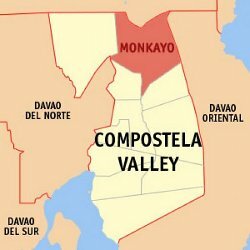 The fertile plain of Monkayo is situated downstream, where people grow crops such as rice and bananas; locally caught fish is eaten frequently. The ore is dug in small-scale mines and ground to a powder by ball-mills while still in Diwalwal. The gold is then extracted by adding liquid mercury (Hg), forming gold-amalgam… 71.6% of the workers were classified as Hg[Mercury] intoxicated. 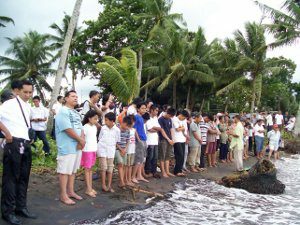 Adventist baptism in Mindanao.Through God’s help our third crusade here in Monkayo, Comval Province was finished last Saturday. There were 215 baptized for the 3 crusades all in all and after the evangelical Evangelist Pastor Arthur Bushnell held a crusade and 215 were baptized.effort made by Pastor Arthur Bushnell Jr(photo right) and Elder Wendell M. Serrano, the SPUC President, of which fourteen of us adopted ministers worked for these 3 crusades. I thank all of our sponsors wholeheartedly for your continued and untiring support to our mission in the world. We praise God for the working of the Holy Spirit. God bless you all. Adventist baptism praises God for the good news they know.Praise the Lord for all the wonderful things He has showered to us. 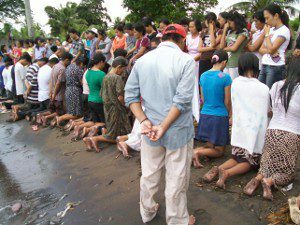 We had just ended our Evangelistic Crusade last Saturday May 30, 2009, and praise the Lord there were 24 precious souls who decided to accept Jesus as their personal Savior through baptism. I am so happy that our endeavors and prayers had been heard by God and the people responded to this call. Thanks so much to all our sponsors for your prayers and support to our ministry. I know you have been praying for us as we for you all. I hope we always share the same vision and passions for the ministry. Our baptism last Saturday was held at the Sea beside the Crusade area. We are so glad for the boldness of these souls despite the raging sea and the big waves. Adventist accept Jesus through baptism. They were still very happy to accept their baptism. We also had mobilized our young people to hold another crusade for them, that they themselves were the speakers, and that was a challenging experience for them. We ended the same schedule though they have no baptism, they meet interested people who are willing for Bible studies. Map of their mission field in Infanta Quezon.I’d like to share with you our pictures during of our work here for 2 weeks in Dinahican, Infanta, Quezon Province. Forty eight (48) precious souls accepted Jesus Christ as their Personal Savior. I’m so glad to be a member of Praise Team (choir). Indeed God is so GOOD. Please pray for us because we need the double power of the Holy Spirit. Praise Team Choir in Infanta Quezon.